United Launch Alliance’s Delta IV rocket has launched with the NROL-45 payload for the US National Reconnaissance Office on Wednesday morning. Liftoff, from Vandenberg Air Force Base in California, was on schedule at 03:40 local time (11:40 UTC), the opening of its launch window. Wednesday’s mission, which was the first for the Delta IV since its successful deployment of a Wideband Global Satcom spacecraft last July, marked the thirty-first flight of the Delta IV and the rocket’s sixth mission from Vandenberg. 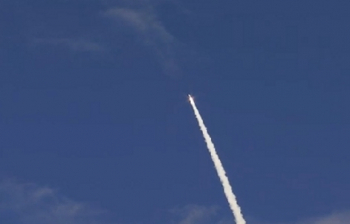 Flying in the Medium+(5,2) configuration, the rocket is carrying out the classified NRO Launch 45 (NROL-45) mission for the National Reconnaissance Office (NRO). Although the NRO keeps most details of its satellites and their missions classified, analysis of the information that is publicly available and comparison with previous missions often allows inferences to be made as to the nature of the spacecraft being launched. Because it is launching from Vandenberg, Wednesday’s mission can immediately be assumed to be targeting a highly-inclined orbit; lower-inclination trajectories such as geosynchronous orbits cannot be reached from the Western Range as they would require the rocket to overfly the Continental United States. Recent NRO launches from Vandenberg have targeted sun-synchronous orbits for optical imaging, highly elliptical orbits for signals intelligence (SIGINT) satellites and low Earth orbits for ocean surveillance and radar imaging spacecraft. Navigation warnings in effect at the time of the launch suggest that the rocket will fly to the southwest, along an azimuth of approximately 222 degrees which would result in an orbit with an inclination of around 123 degrees. Termed a retrograde orbit, a course at this inclination results in the satellite orbiting in the opposite direction to the rotation of the Earth. Other than sun-synchronous orbits, which are often slightly retrograde due to the orbital dynamics involved in maintaining such an orbit, it is unusual for a spacecraft to be placed into a retrograde orbit. The NRO has previously used such trajectories for three missions; NROL-41 or USA-215, NROL-25 or USA-234 and NROL-39 (USA-247). 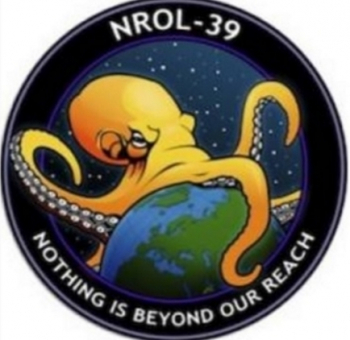 The NROL-25, 39 and 41 satellites are all believed to be radar imaging satellites, part of a program which documents leaked by Edward Snowden to the Washington Post revealed to be named Topaz. Likely the radar imaging element of the otherwise cancelled Future Imagery Architecture program, these are part of a series of five Block I satellites. An enhanced Block II was funded from 2013 which launches expected in the future. An early EELV contract pre-solicitation, dated June 2002 with reference number 63, lists all three of these among four missions that the US Air Force was proposing to award to the Delta IV, which was then under development by Boeing. The fourth and final mission in the document – at the time scheduled for the 2007 US financial year – is the one which will launch Wednesday. The NROL-39 and 41 missions ended up launching on the Atlas V; in 2002 there were no plans to upgrade Vandenberg’s Atlas launch facilities for the Atlas V, so all West Coast missions were automatically awarded to the Delta. NROL-25 was the payload for an April 2012 Delta IV launch out of Vandenberg, which used the same Medium+(5,2) configuration that is being used for NROL-45. This is the only previous launch to use that configuration, which is the least-flown version of the Delta IV. As a result of this, the NROL-45 payload is almost certainly the fourth Topaz satellite, bound for a retrograde low Earth orbit to begin a radar reconnaissance mission. 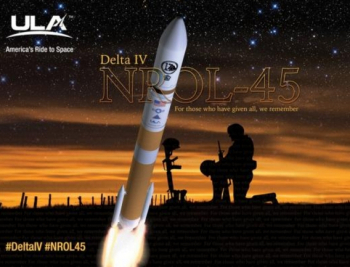 If the documents published by the Washington Post are correct, and there are five first-generation satellites, this leaves next year’s NROL-47 mission – which will also fly atop a Delta IV Medium+(5,2) – the most likely candidate to complete the series. An alternative but less likely interpretation of the same document is that the series consists of a prototype – likely the failed NROL-21 or USA-193 satellite – followed by four first-generation spacecraft with NROL-47 the beginning of the second generation. The Topaz series is a replacement for the earlier satellites, named Lacrosse or Onyx, which were launched between 1988 and 2005. Larger than Topaz, the first Lacrosse was deployed from Space Shuttle Atlantis during 1988’s STS-27 mission while the remaining satellites launched on Titan IV rockets. Lacrosse used two orbital planes, inclined at 57 and 68 degrees respectively. The 123-degree retrograde orbit of the Topaz series covers the same latitudes as the 57-degree Lacrosse orbit. 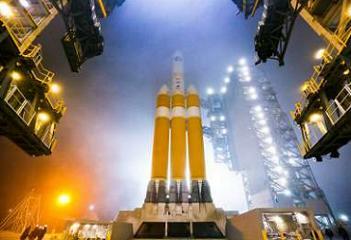 The Delta IV launched on Wednesday sported the flight, or Delta, number 373. Flying in the Medium+(5,2) configuration it consists of a single Common Booster Core (CBC) first stage powered by an RS-68A engine. The stage burns liquid hydrogen propellant, oxidised by liquid oxygen. Attached at the base are a pair of GEM-60 solid rocket motors which provide additional thrust during the early stages of ascent. The second stage, a five-metre Delta Cryogenic Second Stage (DCSS), is powered by an RL10B-2 engine which burns the same combination of cryogenic propellants as the first stage. The DCSS is restartable and is expected to make two burns prior to spacecraft separation and subsequently deorbit itself. 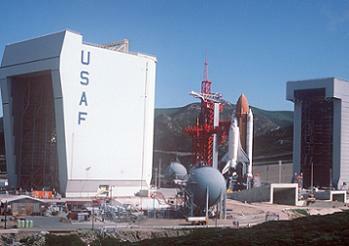 The Delta IV’s launch pad at California’s Vandenberg Air Force Base is Space Launch Complex 6 (SLC-6). Originally constructed during the 1960s to support Titan IIIM launches as part of the Manned Orbiting Laboratory (MOL) program, the facility never saw a launch and was subsequently rebuilt as a West-Coast launch complex for NASA’s Space Shuttle. 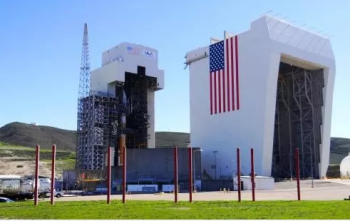 At a time when the Shuttle was seen as the future of all US orbital launches, the pad at Vandenberg would have been predominantly used for military launches, including the deployment of reconnaissance satellites. After the loss of Challenger in 1986 plans to launch the Shuttle from Vandenberg were shelved as part of a program safety review, and the complex remained unused. SLC-6 was finally used for a launch in August 1995, when Lockheed’s small Athena I rocket made its maiden flight from the pad, with an unsuccessful attempt to orbit the GemStar satellite. Three more Athenas flew from Vandenberg between 1997 and 1999; scoring a total of two successes and two failures. Following Athena’s retirement in 2001 Space Launch Complex 6 was repurposed for the Delta IV. Should it be called upon to launch from Vandenberg again, the since-revived Athena will instead fly from nearby Space Launch Complex 8. The first Delta launch from Space Launch Complex 6 occurred in June 2006, with NROL-22. The pad is able to support both the Medium and Heavy forms of the rocket, with the latter being used to orbit optical reconnaissance satellites descended from the KH-11 “Crystal”. Many details of the flight plan for Wednesday’s launch were kept secret due to the nature of the mission. The Delta IV launch saw its first stage ignite its RS-68A engine five and a half seconds before the countdown reached zero, with booster ignition and liftoff occurring at the zero mark in the count. 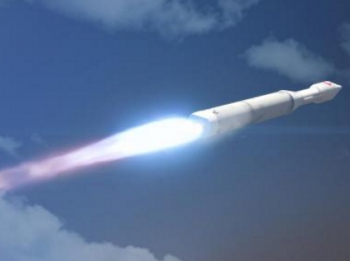 Climbing out over the Pacific, Delta 373 reached Mach 1, the speed of sound, approximately 50 seconds after liftoff. About twelve seconds later it passed through the area of maximum dynamic pressure, or Max-Q. The twin GEM-60 motors augmented the first stage for the first hundred seconds of the flight, before depleting their solid propellant and burning out. About ten seconds later the spent motors jettisoned from the vehicle. About three and a half minutes after launch, with Delta 373 of the atmosphere, the payload fairing separated from around the NROL-45 payload at the nose of the rocket. Once the fairing has separated no further information about the mission will be released by the NRO or United Launch Alliance – other than confirmation as to whether the launch was successful or not. It is expected the Common Booster Core continued to burn until about four minutes and six seconds after launch; with stage separation occurring six seconds later. Following separation, the second stage RL10 engine will have deployed its extendable nozzle ahead of ignition, which would have taken place thirteen seconds after staging. Timings for the second stage burns are not known, however the first is likely to be longer; around twelve and a half minutes in duration. After this the flight will enter a coast phase before the upper stage restarts for a shorter burn – likely to last around 14 seconds – about an hour later. Once this burn is complete, NROL-45 will separate from the rocket. The target orbit for Wednesday’s mission will be close to the Topaz satellites’ operational orbits, which are roughly circular at altitudes a little below 1,100 kilometres (680 miles, 590 nautical miles). After separation the DCSS will perform a third burn to deorbit itself, with reentry expected over the Indian Ocean during its second revolution. Wednesday’s launch was the second of the year for the Delta IV’s operator, United Launch Alliance (ULA). Formed in December 2006, ULA took over operations of the Delta II and IV rockets from Boeing and the Atlas V from Lockheed Martin, bringing the US Air Force’s fleet of Evolved Expendable Launch Vehicles (EELVs) under one roof. ULA provides launch services for US Government missions, and is contracted through Boeing and Lockheed Martin for commercial and foreign government launches. The advent of SpaceX’s Falcon 9 rocket has provided competition to the EELVs for the first time since ULA took over operations of the Atlas and Delta lines, and in response to this and political concerns regarding Russian components on the Atlas V – particularly the RD-180 first stage engine – United Launch Alliance has begun development of a new-generation rocket named Vulcan which will eventually replace both the Atlas V and Delta IV. ULA has already announced plans to phase out the Delta IV, beginning with the Medium configurations over the next few years. 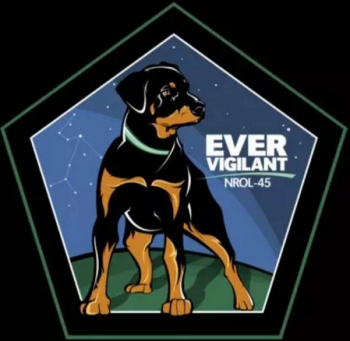 The Delta IV Heavy – which is presently the only rocket capable of carrying the NRO’s optical reconnaissance and geostationary signals intelligence satellites – will remain in service until another vehicle can take over its duties and has passed the appropriate certification. 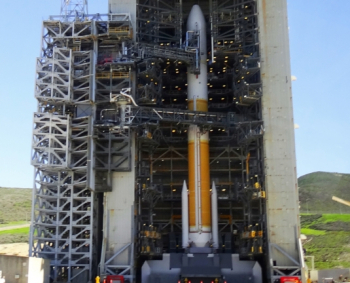 The next Delta mission is expected to make use of the Delta IV Heavy, deploying NROL-37 which is likely to be an Orion signals intelligence satellite bound for geostationary orbit. This flight, which will also be the next mission for the National Reconnaissance Office, is currently scheduled for mid-May. Before then, United Launch Alliance will use Atlas V rockets to launch a Cygnus resupply mission to the International Space Station in March and a MUOS communications satellite for the US Navy in early May. The launch of NROL-45 was the tenth of 2016 worldwide and the third from the United States.